Last week the kids and I were on the beach and while my daughter was busy driving a truck through a sandcastle, my son & I were finding and examining shells and rocks. He was thrilled with one particular find when he looked up at me and exclaimed, "Mom, I love collecting shells with you". It was one of my very proudest mom moments and I had to quickly scoop up all the drippings from my melted heart, right there off the sand! We do a lot of beach visits, well, as many as possible when the weather allows for it. We're fortunate to live in an area that is close to several beaches in Dublin- Killiney, Seapoint, White Rock, and Sandymount Strand, as well as visiting nearby Bray, Greystones and Brittas Bay beaches too. The thing is that here in Dublin, the water is freezing! (This coming from an Atlantic Ocean-loving New England girl). But because the water is colder and the temperatures outside aren't sweltering, my kids don't end up in the frigid water very often. You can imagine that beach days would be slightly boring if you weren't swimming for most of the visit, but we've figured out plenty of ways to keep ourselves busy. Check out this fantastic article from Playtivities that highlights 10 Beach Games for Kids. I love these suggestions- some classic ideas, but also some we haven't tried before, like the water race. We will most definitely be trying that at our next beach outing. Below are two of our favorite beach day activities to add to this already fab list, because truly can we ever have too many ways to keep our kids active and entertained?! Scavenger hunts are always a big hit with kids, and my kids absolutely love this sea themed one. I fondly remember some of my favorite childhood moments that included scavenger hunts. One particularly elaborate hunt by my Aunt Gayle had us searching for toy airplanes in the treetops of our local woods. Because my toddlers can't read yet, we use scavenger hunt lists with pictures. 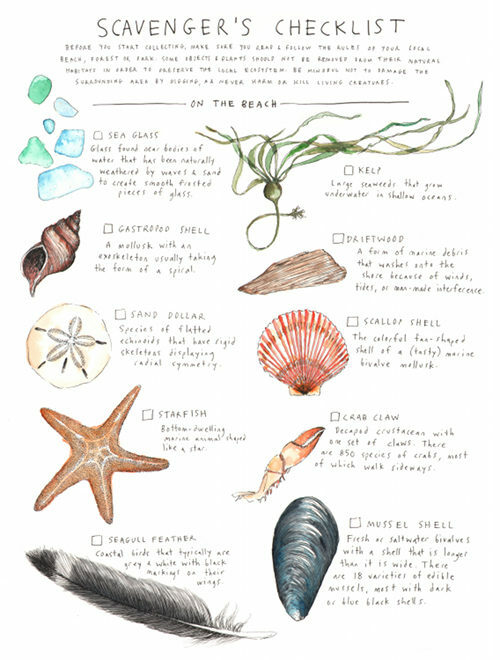 You can make your own custom list with beach themed stickers or drawing your own. But if you want an even quicker option, there are some really great downloads available online. Check out this post, with a free colorful checklist printable from Buggy and Buddy. Or this post, from Mindfully Frugal Mom, which includes a free printable PDF of another beach list. Just print and bring along on your next beach visit. Another excellent option is to make Scavenger Hunt Cards. I photocopied images from this gorgeous watercolor from DesignSponge- seriously, how beautiful is this print? I cut out 8 of the 10 images, keeping only the items that we might find on our beaches here in Dublin. Unfortunately for us, we have yet to see a Starfish or a Sand Dollar, so we'll save those for a visit to somewhere like Florida or the Caribbean (some day!). Using some thick, white card stock, I pasted the images to the paper to create two little square card sets to take along in our beach bag. I'd nearly frame this DesignSponge piece, it's so pretty! Here are the 8 images after I cut and pasted them to the card stock. The images are a Mussel Shell, Crab Claw, Driftwood, Seaweed, Scallop Shell, Sea Glass, Seagull Feather and a Gastropod/Snail Shell. I'd love to someday expand this set to include Barnacles, Hag Stones, Limpets, Yellow Periwinkles, and Clam Shells, mostly because they are common finds here and we come across a lot of them. And I'd maybe even add a question mark for a mystery find that could be something like a coin, button, clay bead, or any other interesting object. I love that we never know what we'll find. This little set stays in a pocket in our beach bag, just waiting for it's next use, where we can search for, sort through and identify our discoveries together. My curious creatures are always collecting! Using objects found on the sand or in the sea, create your own masterpiece! These silly faces we made as a family of 4. The square faces were made with boys versus girls teams and the round faces we switched up the teams with mom & son versus dad & daughter. Seaweed for hair, various rocks for the body, head and bikini top, sticks for a spear and green sea glass for a scaly tail and ta-da! You've got yourself a warrior mermaid. To make this I told my 3-year old daughter the color & sized rocks and seaglass pieces that we needed and she would bring back several options until we had enough to make the art. This deserted island was made with mussel shells for the water, crab claws & a broken limpet shell for the sun and rocks in shades of light brown for the sandy island. All items found by 2-year old Harry & I at Greystones Beach, but I definitely directed the placement! So what do you like to do while you're at the beach? I'd love to hear your creative ideas in the comments section below. And if you need a suggestion for using up all those shells you discovered at the beach, then take a look at this previous blog post for some creative artwork we made. love the post, the ocean, the fantastic ideas! But most of all love all of you, a wonder read! You do have such a great yard for showcasing parts of your collection! And it's so lovely to share the stories behind the pieces with the kids! Love love love this post. You come by it naturally a beach lover and collector. Great grammar is up in heaven smiling down on yet another generation of beach collectors and savers. I love my different size and shapes of jars and bottles (almost as much fun to find at yard sales as the shells)to display my findings as well as the ones she had collected when she would visit the beach. Such a great legacy to keep going in our families. Thank you so much!! And who didn't love going to visit you at your house to inspect all the jars of sand and shells you had lined up! What a great idea and wonderful collection you had! And I most definitely miss a good full day of yardsaling!